Miller Moments: Variation on a favorite - or - Chicken, Bacon Alfredo Pizza! Variation on a favorite - or - Chicken, Bacon Alfredo Pizza! Have you ever noticed that when you do something over and over it becomes mundane and you get to the point where you don't even notice it anymore? You don't recognize the nuances that made it special in the first place - those things that first drew you to enjoy it. Take pizza for instance. I recall my first ever pizza. It was at a mom & pop joint in rural Soda Springs, Idaho. It was in the mid 70's. It was HUGE! And it was covered with melted cheese, wonderful marinara, sliced olives and pepperoni galore. From that first bite - I was hooked. 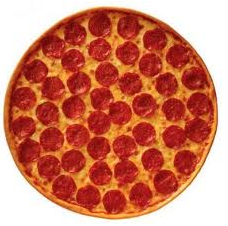 I've had lots of different kinds of pizza - but we always wander back to that classic favorite - pepperoni. While visiting with family this summer - our daughter and son-in-law made a bar-b-que chicken pizza. It was nothing less than amazing. Last night I spread my wings a bit and made a 'from scratch' chicken, bacon alfredo pizza. I'm sorry that it was gone before I even had a chance to take a picture of it - but let me share the recipe. Combine all dry ingredients in a bowl and stir quickly to combine. Add wet ingredients and mix well. Add enough more flour to make a soft dough. Knead until smooth and elastic. Cover and let rest on the counter or in a warm spot for about 10 minutes. If using a pizza pan - spray with nonstick cooking spray and dust with cornmeal. Roll and stretch the dough to fit the pan. (this makes enough for a LARGE pizza). While dough is resting - cook 2-3 chicken breasts with your favorite seasoning. I use garlic powder and Lawry's seasoned salt on mine - along with a little pepper. When the chicken is almost done - I cut it into bite-size pieces and finish cooking. Cook 4-6 slices of bacon till crisp - blot with a paper towel to get rid of excess grease, then break into bite-size pieces. Using your favorite alfredo sauce generously spread over the dough. Add grated mozzarella, cheddar and monterey jack cheese over the sauce. Top with cooked chicken, bacon, chopped green onions, chopped or shredded green/red peppers, sliced olives and fresh tomatoes. And tell me how you spice up something ordinary to make it new and wonderful.